Service Robotics Market size was valued at USD 8 billion, with global shipments of over 7.5 million units in 2016. Increasing demand for reducing the operational costs and the time consumption due to human intervention has led to a rise in the demand for services robotics market. The industry is also witnessing high growth opportunities from the logistics sector owing to the increasing wage rates, the ability to increase the throughput, and a high return on investment offered by these machines. Moreover, the increasing demand for automation to ensure high precision across various sectors, such as healthcare, agriculture, retail, military & defense, is expected to drive the service robotics market growth. Ongoing technological advancements in the field of robotics further contribute to the industry demand. Advancements in technology, such as cloud, IoT, machine learning, and artificial intelligence, are making the adoption of robots beneficial and easy. Manufacturers are trying to incorporate such technologies into the machines for enhanced performance and improved human-robot communication to transfer the real-time information. The rising penetration of IoT & deep learning technologies into the systems is enhancing the overall functionality of the robot. It enables them to take decisions in the real-time in robust industrial environments & unpredictable situations, propelling the market growth. Factors such as the requirement of high capital investments, increasing R&D costs, and the complexity associated with programming the robots are expected to hinder the service robotics market growth. Moreover, the high cost of these machines is expected to affect the adoption rates in industries that have budgetary constraints. Lack of awareness about the advantages of these robots in the emerging economies coupled with the safety concerns associated with the use of such machines is limiting the market growth. Personal service robotics market is expected to witness a growth over the forecast timeline. The growth can be attributed to the increasing demand for personal assistance across households coupled with the growing aging population in countries including Japan and Germany. Rapidly aging population in these countries generates a high demand for advanced medical care and nursing solutions. With the growing number of senior citizens, the number of caregivers remains stagnant. These machines are capable of providing good assistance to elderly people by diagnosing simple ailments by using technologies such as AI and machine learning. Growing demand for automation in households coupled with the rising labor costs across various economies is providing an impetus to the personal service robotics market growth. Vacuum cleaning, floor cleaning, and lawn-mowing robots are gaining popularity in the residential sector and these are increasingly utilized for performing domestic tasks, such as cleaning & mopping, considering the high costs associated with hiring workers for such tasks. The demand for logistics service robotics market is on the rise and is anticipated to witness a significant growth over the forecast timespan. The growth can be accredited to the increasing deployment of such robots in warehouses to obtain operational efficiency across various business processes such as container loading & unloading, picking objects, and custom packaging. These robots offer high-level accuracy, safety, and efficiency across a range of applications as compared to their human counterparts. The growing demand for robots in the military & defense sector provides lucrative growth opportunities to the defense service robotics market. It can be accredited to the rising usage of such machines for a number of applications such as surveillance, collecting intelligence, demining, and border control. Countries including the U.S. are heavily investing in the defense sector and plan to downsize military by replacing human troops with technologically-advanced autonomous or remotely-controlled robots. North America dominates the industry in terms of revenue and is expected to witness a significant growth over the forecast timeline. The presence of a developed infrastructure followed by the increasing demand for automation across various sectors is compelling the adoption of robotics technology. Rising investments coupled with the keen interest of the regional government to incorporate the use of the latest technologies for security purpose are aiding the defense service robotics market growth. Defense budgets in the region are on a rise, considering the ever-increasing security violations and terror threats. To ensure the safety and security of the nationals, the regional government is making significant investments in such new and advanced technologies. For instance, in 2016, the U.S. Defense Advanced Research Projects Agency (DARPA) announced to invest nearly USD 3 billion in the development of new military technologies, which include automated technologies and combat robot warriors. 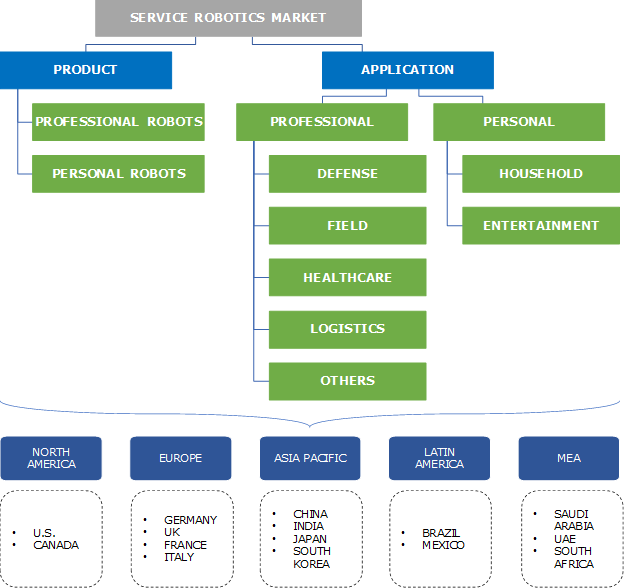 Major players in the service robotics market include DJI, Bluefin Robotics, iRobot Corporation, Intuitive Surgical, Softbank Robotics, Honda Motors Co., Ltd., Medtronic, Northrop Grumman Corporation, Ecovacs Robotics, Samsung Electronics, Ecovacs Robotics, Yujin Robot, Lely, and DeLaval. The industry is highly fragmented and competitive considering the increasing number of new entrants with advanced technological solutions and the presence of established players in the marketplace. Players are increasingly focusing on developing new technologies, enhancing the current product portfolio, and introducing new products with improved functionalities. The service robotics market is characterized by intense competition among the industry players. With further expansion of the market, the competition is expected to intensify over the forecast timeline due to the entry of additional players entering the industry and the established players expanding the product lines. The growth of AI-infused robotics applications in educational institutions and entertainment sectors is propelling the industry growth. Rapid industrial growth in countries across Asia Pacific and Europe has led to a surge in the demand for automated processes for enhanced productivity. Rising labor costs in various countries across the globe are compelling the increasing utilization of robots, further contributing to the industry demand.